Avoid these ingredients at all costs. While pregnant, you’ll want to avoid certain things that could put you and your baby’s health into jeopardy. Among the many concerns that expecting mothers have are the products they use on their bodies. Some substances are extremely dangerous when ingested, inhaled or absorbed through the skin and come with warning labels urging pregnant women to steer clear of them. Being aware of the dangers that exist helps you become a more informed and better-prepared shopper of skin care products. If you’ve never been pregnant before, shopping while carrying a child may feel like unfamiliar territory. 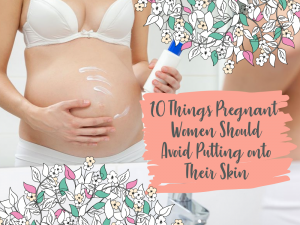 However daunting the task may seem, rest assured that it’s far easier to shop for cleansers, moisturizers, and sunscreen that is safe for pregnancy thanks to the amount of information available online. Within seconds, you can research an ingredient, discover its risks, and learn which products contain the chemical you want to avoid. Similarly, you’ll learn about which companies cater to pregnant women by using natural ingredients derived from plants and their leaves, stems, flowers, and fruit. You’re also able to ask questions, request additional information, and read testimonials from customers who swear by certain products and who are willing to give you an unbiased overview of their purchase. •	Retinoids. Many anti-aging medications contain what is also known as retinoic acid, isotretinoin, tazarotene, retinyl palmitate, retinaldehyde, tretinoin, and adapalene. The substance can cause birth defects in babies and should be avoided at all costs. •	Tetracycline. This ingredient is used to treat acne. It causes liver damage in pregnant women as well as problems with the baby’s teeth. •	Hydroquinone. This skin lightening ingredient should not be used until after a baby is born. It is absorbed into the skin after topical application. •	Phthalates. Abnormal development of fetuses often occurs because of ingredients such as benzylbutyl phthalate, dibutyl, diethyl, BzBP, DBP, DEP, and DMP. They are found in many haircare products such as shampoos. •	Formaldehyde. Other names for this ingredient are quaternium-15, sodium hydroxymethylglycinate, dimethyl-dimethyl, diazolidinyl urea, Imidazolidinyl urea, 2-bromo-2-nitropropane1,3diol or bromopol. This product comes into contact with the scalp through hair straightening products and the skin on the eyes through eyelash glue. •	Toluene. This chemical is found in nail polish which doesn’t necessarily come into contact with the skin unless you have an unsteady hand and paint outside your nail. Still, you could rest your face on the tops of your freshly painted hands, however, and come into contact with methylbenzene, toluol or antisal 1a indirectly. •	Ammonia. This ingredient is mostly found in hair dye. Again, it is something that comes into contact with your scalp and other parts of your body as it is rinsed out of your hair. •	Dihydroxyacetone. Self-tanning products often contain this ingredient which is also known as DHA. It isn’t absorbed by the body but could be inhaled while being sprayed onto the skin. •	Thioglycolic Acid. Some hair removal creams contain this ingredient. It may be labeled as acetyl mercaptan, thiovanic acid, mercaptoacetate or mercaptoacetic acid. •	Botulinium Toxin. Botox injections aren’t necessarily harmful for pregnant women. They do contain the chemical botulinum toxin, however, which doesn’t seem like something we’d want to take chances with. Avoid ingredients with names you can’t pronounce easily. Opt for skin care products made from all-natural ingredients and ones that are clearly labeled safe for use by pregnant women. That way, you’re not having harsh chemicals come into contact with your skin and harm your unborn baby.